Well, it’s been a bit quiet here on the blog … although there has been a lot of behind-the-scenes activity here at Cthulhu Reborn Underwater Lair, including the launch of a few new projects. I hope to share some news about cool new future releases sometime in the coming days. We are also still working on the next in the Convicts & Cthulhu “Ticket of Leave” PDFs, although it is starting to look like that may not be released in April as planned but spill over into early May. It will be themed around colonial medical horror — so it’s strangely ironic that its delay is due to key folks getting ill. Maybe it’s evidence of the Curse of the Convict Sawbones at work! 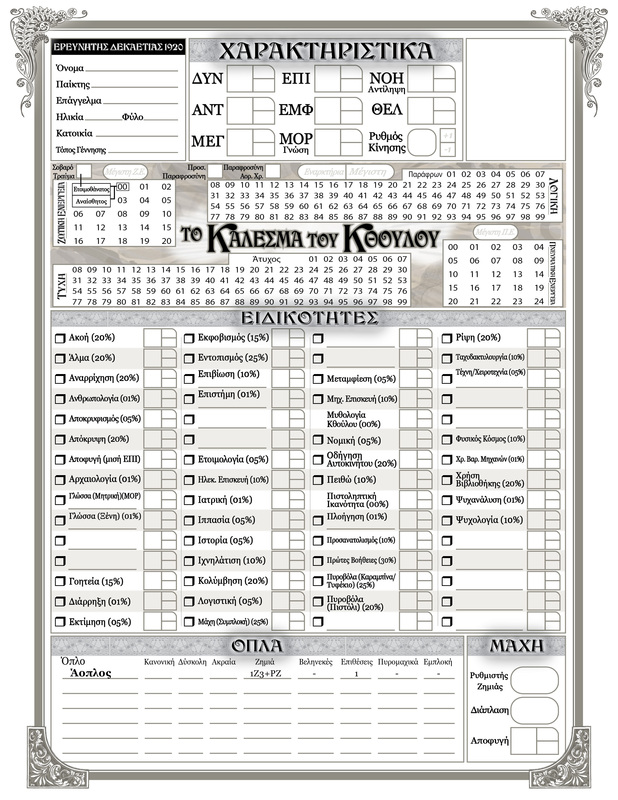 One small activity that we *have* recently completed is the translation of both the 1920s and Modern-day CoC7e character sheets into Greek. This came as a request from a fervent fan of CoC who lives in Greece — where there is no current local publisher for the game — and wished that he and his players could use sheets in their local language. We were happy to oblige … with a lot of translation notes (we don’t speek Greek!). 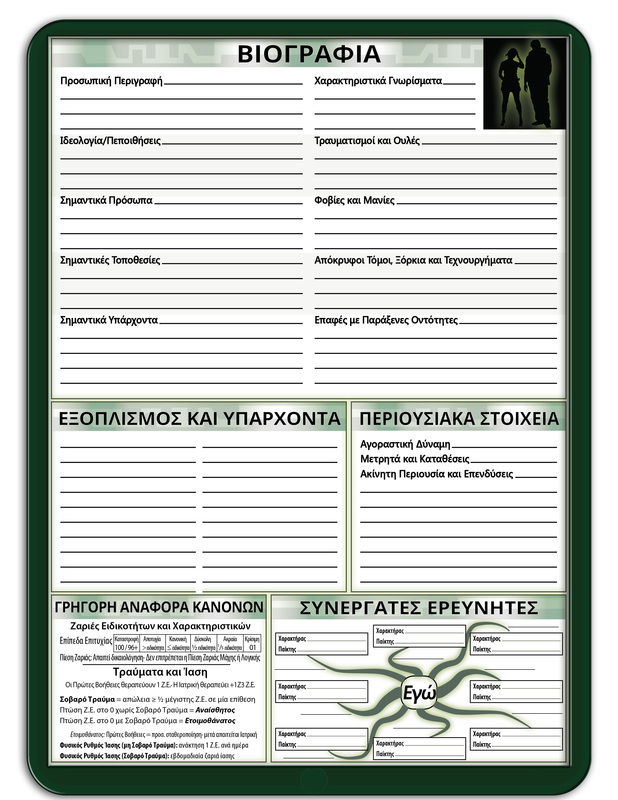 And since it’s always possible that there are other Greek-speaking gamers out there who might like to use these same sheets, I figured I would make them available for download here. So … I present to you, the PDF version of the Greek-language 1920s CoC sheet, and the PDF version of the Modern-day equivalent. These files are also available on the Cthulhu Reborn downloads page (along with a lot of other cool character sheet designs). There are also JPG versions of front and reverse sides as well, if those are what you’re after. This entry was posted on Thursday, April 19th, 2018 at 1:27 am	and posted in Cthulhu Game Aids, News & Updates. You can follow any responses to this entry through the RSS 2.0 feed.